March 1 – 3, 2019 – Music, Inspiration, Creativity… for Youth! Students are invited to join us for three days of classes and mentoring. Young people from three states and six communities gather to learn and share songs and stories from their hearts and minds. The Academy provides a non-competitive format for high school youth to learn the basics for songwriting, performing, and overall musicianship from professional musicians and one another. The most important values shared are mutual respect, support and nurturing of one another and each person’s creative journey. Many thanks to the teachers, volunteers, supporting partners and ASAY patron, Cris Converse. 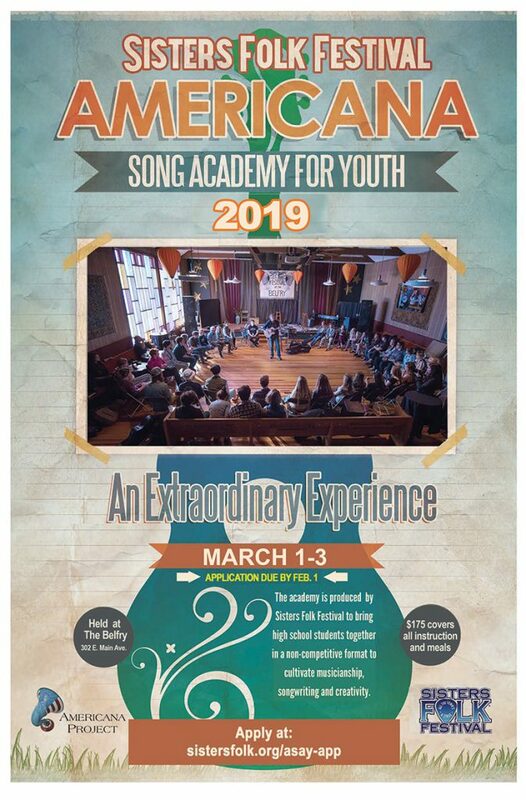 The Americana Song Academy for Youth (ASAY) brings high school students together in a non-competitive format to cultivate musicianship, songwriting, and creativity. From songwriting to forming bands, to developing a community of like-minded individuals, young people get to share and explore their love for music. Over one weekend, students learn from local and regional touring artists what it takes to pursue music on a professional level. Many instructors are alumni of the Sisters Americana Project, thus helping to model for young people a tangible pursuit when they get out of high school. The program in Sisters acts as the hub in a wheel, and our students generously share their experience and the stage with students from throughout Central Oregon and Pagosa Springs, Colorado. The weekend will culminate with Celebration of Song at The Belfry on Sunday, March 3rd. Doors open at 6:30 pm and the concert starts at 7 pm. The concert is free to the public, with a suggested donation at the door. Doug was a founding member of the first Sisters Folk Festival house band and an advocate for the ASAY program; he believed in its purpose. Each year the Saturday night Open Mic performance is dedicated to the memory of Doug, which inspires everyone involved to give back and be community-minded. We thank Doug’s sister, Cris Converse for continued support of the Americana Song Academy for Youth.